1) All you need is 2 to 3 cups of cream, what you do is add two tablespoon of yogurt to clotted cream (you can also use heavy cream) stir it , cover it and then let it sit at room temperature for almost 12 hours. 2) The next day when you are ready to make butter, add 1 cup of cream at one time with 1&1/2 to 2 cups of water in a blender (use cold water during summer, and luke warm water during winter). In the beginning the cream will begun to smoothen and you will get smooth whipped cream. 3) Continue to blend until you see buttermilk and the thick butter getting separated. You will see lumps of butter floating in the buttermilk. 4) Turn off the blender, with the help of slotted spoon take out all the butter in to a bowl. pour the buttermilk in a jug for latter use, now add the 2nd cup of cream along with water and follow the same procedure. 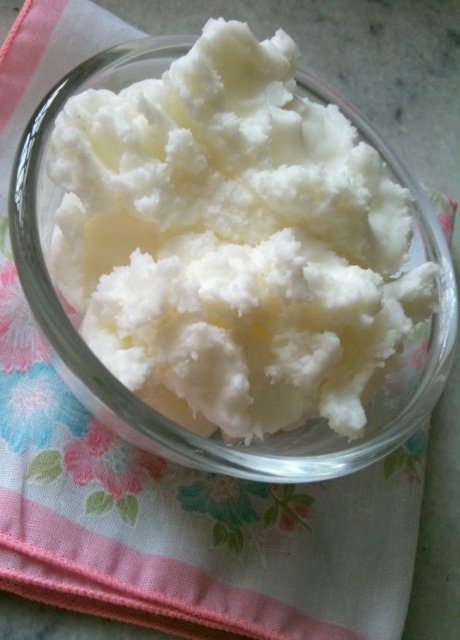 5) Once you are done with making butter, run your hands under cold water, Form the butter into a ball, press the ball to squeeze out any excess buttermilk then squeeze the butter together, (or you can also do it with the back of a spoon). 6) Place the bowl in the sink, rinse the butter in cold water, and squeeze it again. Repeat this process until the water runs clear and the butter does not release any liquid when you press on it, that’s it, home made butter is ready, you can keep it in the refrigerator for a week. Note: Don’t discard the buttermilk, you can use it for baking, or add it to mashed potatoes as a substitute to milk. You can also" lassi" with it, a typical Pakistani drink served with breakfast or lunch. it's very simple to make and is very good for the digestive system too, just add a pinch of salt to one glass of butter milk(or a tsp of sugar for the sweet lassi) whisk it or blend it in a blender to get a slight froth. That’s it, pour it in to the glass and enjoy this refreshing drink.